Korean Drama Box: Actor Lee Min-ho: "Past trials led me to drama role"
hope you do end up withjandi your roles are meant for each other you are very good am in states and so far love you two in this show just hope it ends with the two of you. i would like to see min ho and jandi as a truly couples! i really like the boys overs flower movie. i really love your movies ..
and hope you could drop in indonesia,because i want see jun pyo and jandi. 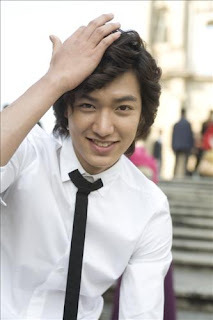 jun pyo i love you! ! ! !i wish you could visit here in the phillipines! ! ! ! I'm Himali from India.Lee Minho, you are the first & last person in the world whom i've liked so much.i want to meet you.my friend are telling me this days that i've become mad after you & they've never seen me like this. lee min ho as gu jun pyo is a complete definition of how man should be......its so breathtakin to watch da way he holds upon a gal he is in love....i simply loved yuh on screen...guess lee min ho is same offscreen......i neva get tierd of watchin boyzz over flowers!! would u like to write about his new drama ? or u have been wrote it ? can i know where ?? i am ans from panyam you are my most favourite jandi & leemin.